A medium sized room, 30 sqm approx, Ideal for a couple and 2-3 young children. 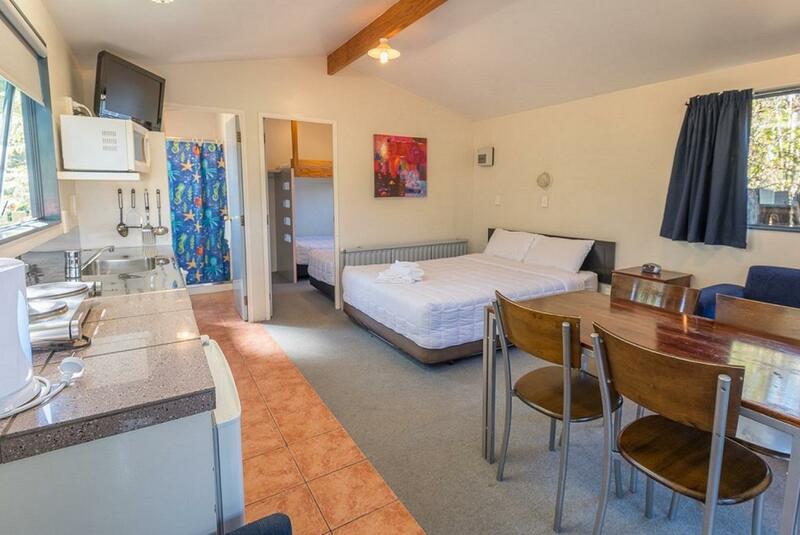 A separate bedroom has 1 single bed and one single bunk bed for 3 people. The lounge has a Queen sized bed, couch, TV, table and chairs. The lounge is thermally heated in winter. There is a fan as well, but no air condition. Maybe hot in summer season. Also includes a kitchenette with mini fridge, 2 element hob, microwave and kitchenware. There is a private bathroom with a toilet, hand basin vanity and shower. The live area has a TV, table, chairs and a sofa. There is a fan in the room, no air condition. There is no room services. We offer complimentary tea and coffee but no milk. Small room, 25 sqm around, Ideal for a couple plus 2-3 young children's family with low budget. One double bed plus one single bunk bed. A single bed might be available (Please discuss with reception in advance). The room has TV, table and chairs. There is a fan in room, no air condition. So might be hot in summer. In winter the radiator is thermally heated. Also includes an equipped separate kitchenette with mini fridge, 2 element hob, microwave and kitchenware. 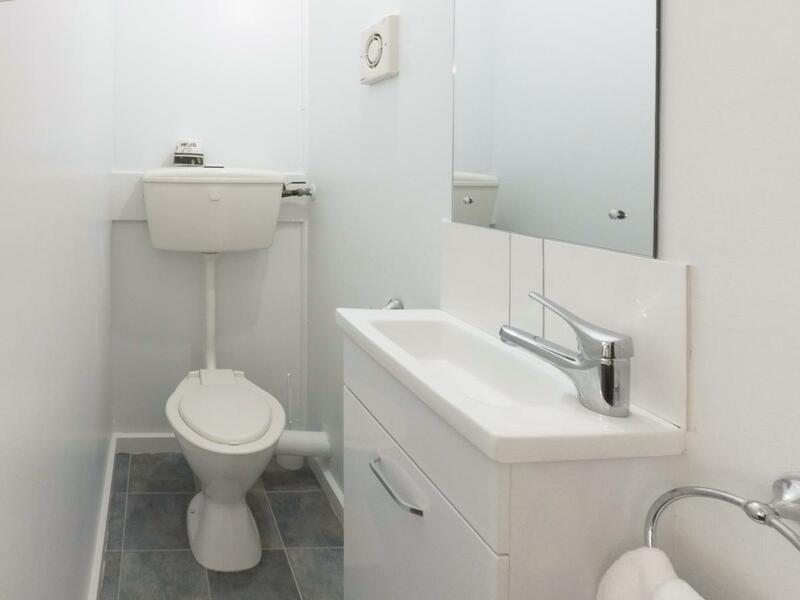 There is a small private bathroom with a toilet, hand basin vanity and shower. There is no room services and no tea and coffee supplied. Bedding configuration: Fully made double bed in lounge area Single Beds/bunks not made, but covered with clean bottom sheet and pillowcases. Free additional top bedding and towels for single beds on request. A small room, 25 sqm approx, Ideal for a couple plus 2-3 young children's family with a low budget. One double bed plus one single bunk bed and a davenport which can be used for a young child to sleep on. The room is part of two floors office building located on ground level. Sometimes might be a bit noisy when there are guests check in and out. You are recommended to look first before you decided to make a booking. Small room, 20 sqm around, Ideal for a couple plus 2-3 young children's family with low budget. One double bed plus one single bunk bed. A davenport may be for a young child to sleep. Also includes a separate kitchenette with mini fridge, 2 element hob, microwave and kitchenware. There is a toilet has a hand basin vanity but NO shower. 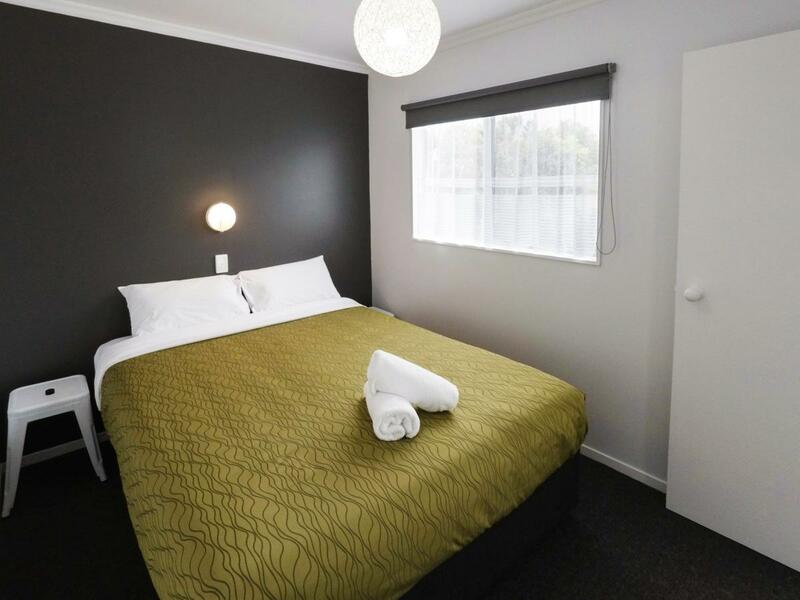 You may use communal facilities which is just few meters away. No room services and no tea and coffee supplied. Bedding configuration: Fully made one double bed, Bunks for 2 persons covered with clean bottom sheet and pillowcases. Additional top bedding for single beds and towels available upon request. A small room, 20 sqm approx, Ideal for a couple plus 2 young children with a limited budget. One double bed plus one single bunk bed. A davenport maybe used for a young child to sleep. The room has a TV, table and chairs. There is a fan in the room, no air condition. Maybe a little hot in the summer season. In winter the radiator is thermally heated. There is NO toilet and shower in the room. But you may use communal facilities which are just a few meters away. 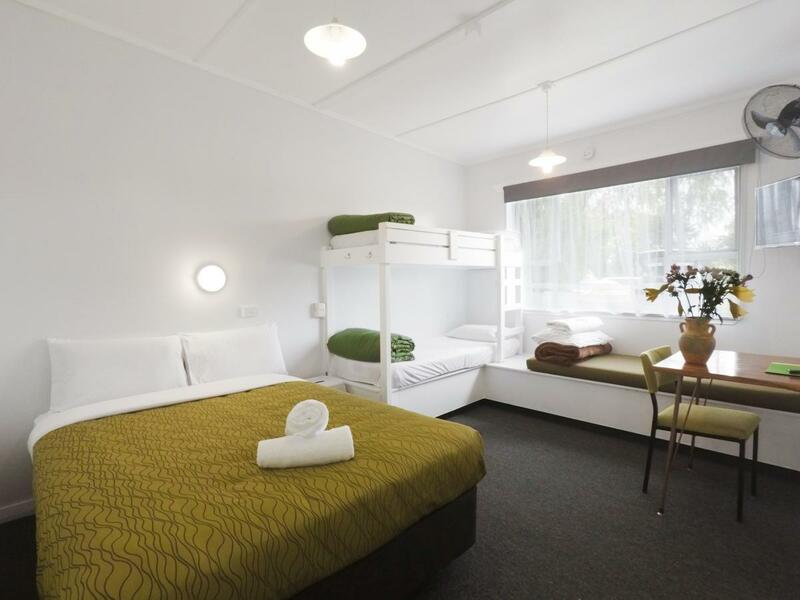 In the room, there are four 4 bunks, for up to 8 people. Please note: This room is on the 2nd floor. The communal block in downstairs which includes 24/7 hot shower, hot pools and kitchen which is open 7 am - 10 pm. No room servicing and no cooking, eating or alcohol allowed in the room. 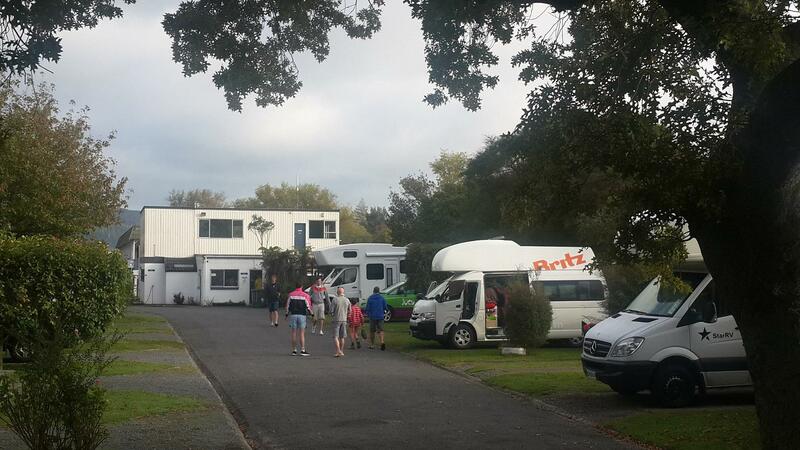 The powered sites are suitable for Campervan/Caravans needing electricity. Most sites are suitable up to a 6.5 meter campervan. If you have a large size vehicle, please discuss with reception when you make the booking. 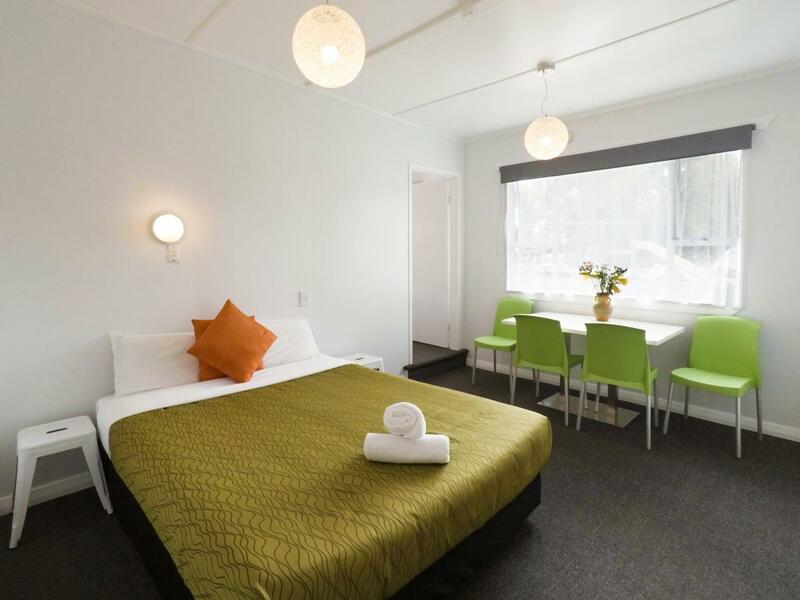 Guests have free use of all campground facilities including showers, communal kitchen, BBQs, steam cooker, TV Lounge, swimming pool and hot mineral pools. Most sites are good for 2-4 people's small to medium size tent up to 6 sqm plus your vehicle. If you have a large tent or more than one tent and/or one car, please discuss with reception when you make the booking. Optional by request, ?WORLD FAMOUS HEATED TENT SITES? are on naturally occurring heated ground, keeps you ?warm as toast? on those cold nights. Rates include free HOT showers plus enjoy our Thermal Hot pools open year round and a swimming pool (seasonal). 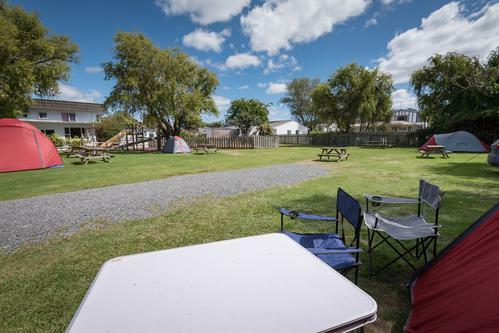 Campground Kitchen, games room, playground and steam cooker are included. Free BBQs and Lake Shore access.